The founder of the cult of the meteorite church is strongly against the operation to bring the chunk out of the lake, claiming that as long as the meteorite stays at the bottom of the lake, it is “in a positive environment”. “Contact with outsiders, who treat it as an average stone, can violate the information contained in it. We already see the perturbation of the noosphere from constant attempts to lift the meteorite in fomenting international instability around Syria,” Breyvichko told the First Regional Channel. 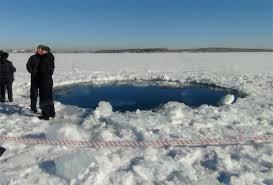 There are currently about 50 believers in the Church of the Chelyabinsk Meteorite. These days they are busy holding rites on the shores of the lake, trying to protect the meteorite by building “protective barriers” around it, LifeNews.ru reported. “I think it won’t hurt Chelyabinsk to become a truly holy city, home to a great temple that will be the object of pilgrimage for millions of people from across the world,” Breyvichko stated.